This entry was posted on February 10, 2012 by Charles Ford. 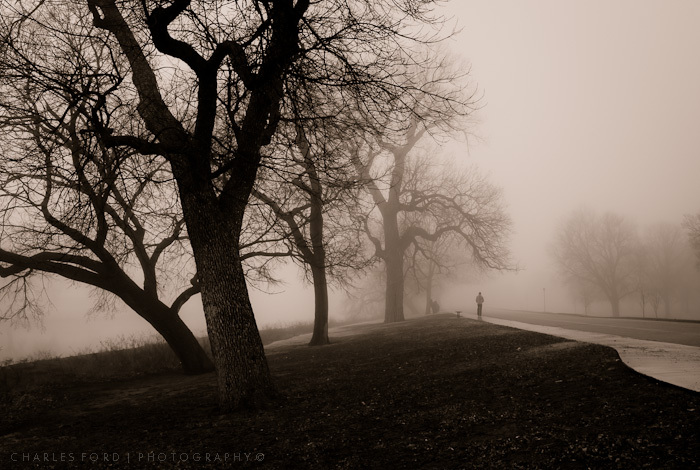 It was filed under Fog and was tagged with Black and White, Fog, Photography, Toning, Walk, Wichita. It does work well. A great bit of fog as well. Good shot. I think it works really well! This would be a fine shot without the walker but that person gives so much more interest to the shot. One thing I worry about is that the person in the shot may overwhelm the composition, but that is certainly not the case here. I think the walker adds an air of melancholy. I like it a lot.